Light leaves the source and is split into two paths at the beam-splitter BS. The blue light path goes along arm 1 to 2 to 3 to 4 and then exits at the detector. The red light path goes along arm 4 to 3 to 2 to 1 and then exits at the detector. 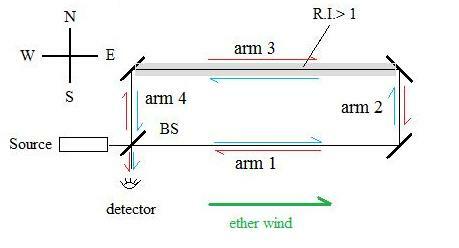 The two beams are made to interfere at the detector, and any shift in the interference pattern would reveal a difference in the propagation time between the two paths. All of the arms are in air, except for arm 3, which is in water, which has an index of refraction of 1.333.
n = refractive index of water = 1.333 Arm 3 lies on the W to E line of the compass. so the expected fringe shift between the two beams would be: Dt* c / l = 246 fringes. However, Hoek did not see any fringe shifts at all. See his original Hoek paper in English here. Arm 3 in line W to E.
n = refractive index of arm. This value for j was the well known Fresnel Drag coefficient. the value in the square brackets is the Fresnel Drag coefficient. This new understanding meant that it is the light being dragged by the dielectric medium and not the ether which is responsible for the null result. It was Lorentz's accomplishment in explaining why no interferometer experiment could be successful in detecting an ether, that made it convenient for some to do away with the ether altogether. What cannot be detected does not exist, or at least that was the attitude taken by Einstein when he used Lorentz's theorem of corresponding states, now re-named by Poincare the "Lorentz transformations" and incorporated them into his new theory of special relativity. First order tests cannot be used to distinguish between special relativity and ether theories, as has sometimes been stated. No such "experimentum crusis" is possible in principle, since the two classes of theories can be transformed into one another by a change of conventions about clock synchronization." des sciences exactes et naturelles 25 (1892): 363–552. Vol. 8, No.7 (1977) p. 515-524.